The Delta Hybrid range of rotary lobe compressors is used in a number of major industrial production processes, and efficiency is the basis of its design. 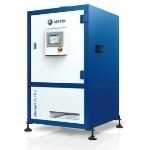 According to estimates, around 90% of the costs sustained over a compressor’s lifecycle are for the energy it uses up. This poses a substantial cost and must be considered in designing for competitiveness and ecological sustainability of a process in the global market. Therefore, AERZEN has concentrated on developing compressors that are high in energy efficiency, saving up to 15% of energy costs. This scale of energy reduction means that the return on investment for a machine in this range is 100% within merely two years, based of course on the volume flow and pressure levels necessary in the workflow. This represents the exceptional characteristics of the Delta Hybrid. The Delta Hybrid is an innovative rotary lobe compressor which incorporates the best of the rotary lobe blower and the screw compressor, thereby producing pressure or vacuum in a ground-breaking manner with the advantages of both approaches in one. Low pressure is brought on by the Roots principle, which requires isochoric compression, while the generation of higher or positive pressures calls for internal compression, which is most successfully applied by using the screw-type compressor. The combination unit is packaged with all necessary components as standard because of the success of its popular predecessor, the AERZEN Delta Screw Compressor and Delta Blower, with a further improved design. The Delta Hybrid range is user-friendly and requires less maintenance, which has a positive impact on the efficiency and profitability of the process. This can be traced to the design characteristics which AERZEN concentrated upon while building these machines, resulting in an offering of compressors which are easy to use and bring joy at the sight of a strong bottom line. The Delta Hybrid realizes up to 15% savings on energy consumption. 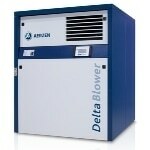 It provides a control range between 25% and 100%, and its use results in lower losses of pressure and air flow. It uses innovative IE3 engines which are of superior performance. It has a belt drive which helps guarantee accurate volume flow. The Delta Hybrid expands the range of applications to positive pressures of up to 1,500 mbar and vacuums of up to -700 mbar. It can manage outlet temperatures between 160°C and 230°C. This compressor does not have any absorption material which means that the noise level will be low as the discharge muffler redirects process air instead of the absorption material. Furthermore, the air rerouted is free of this material and thus contaminant-free, which is a critical consideration in the food sector, for example. It is certified as a spark extinguisher in adherence to ATEX specifications. The Delta Hybrid has a robust build and its original bearings help to provide it a lifespan of more than 60,000 hours when working at differential pressures of 1.000 mbar. Its driving chamber and conveying chamber seals are also patented for prolonged lifespan. Its operation is fully oil-free and thus class 0 as per ISO 8573-1. 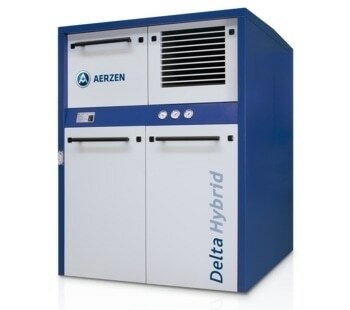 In brief, the Delta Hybrid is ideal for use in a number of industrial processes, particularly when they necessitate neutral or air gases to be transported in an oil-free manner. It is available in nominal sizes ranging from DN 100 to DN 300 for both positive and negative pressures. A number of other applications are also coming up in new domains.